New Country. New Conflicts. 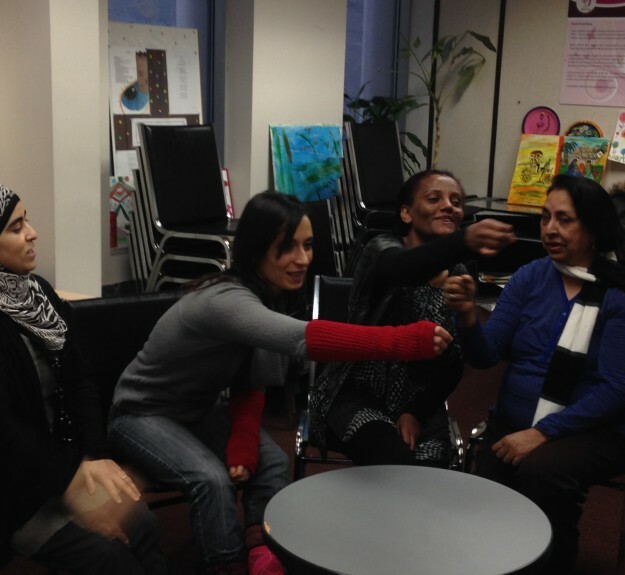 is an original forum theatre play addressing issues facing newcomer women in Canada. The play explores themes of discrimination, racism, isolation and the struggles of obtaining a work permit-based on the lived experiences of participants in the From the Roots Theatre Project. New Country. New Conflicts. challenges audience members to transform the conflicts in the play scene by scene; building collective support and finding new strategies for tackling these ongoing issues. New Country. New Conflicts. was co-created by participants in the From the Roots Theatre Project, led by Naomi Tessler, as part of an ART Place Artist Residency Project with Arts Ottawa East Art’s Council, in partnership with Immigrant Women Services Ottawa. From the Roots Theatre Project is an intensive applied theatre program for newcomer women based in Ottawa in which participants build theatre, performance and leadership skills and co-create and tour an original forum theatre play addressing issues facing the newcomer women community. New Country. New Conflicts has been performed in Ottawa for multiple audiences of newcomers and frontline workers serving immigrant communities. The play has served as a catalyst to address these pressing issues on and offstage and has supported the actors to build self-confidence, self-empowerment, gain community support and new resources. Check out our photos from From the Roots Theatre Project and New Country. New Conflicts Here.